Faulty original construction of roof trusses has made necessary substantial repairs to roof supports of the Mt. Vernon Methodist Church. The weight of the roof was pushing the walls out of plumb and to relieve this situation three large steel trusses were constructed and installed to support the roof and take the weight entirely off the original supporting wood plates. Two of these trusses are 54 feet each in length and more than 5 feet high. A third truss is 40 feet long and some 6 feet high. Designed and fabricated by Frank L. Keck, of Keck Gonnerman Co. and erected by contractor Herman A. Becker and crew, the trusses have a combined weight of close to six tons. When the improvement program is completed the local church will be one of the most substantial and attractive houses of worship in Southern Indiana. Pending completion of the work and re-opening of the church all worship services will be held in the parish house at Fourth and Locust Streets. The adult and young people’s Departments of the church school will also meet at the parish house, but for the present the primary and junior departments will continue to meet in their respective places in the church. 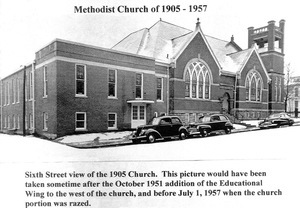 Note: The parish house was the former German Methodist Church parsonage that was across Locust Street where the German Methodist Church was located which is now the Shell Gas Station in Mount Vernon.